Incorporating an elevated cycling veloway as part of the Coburg Level Crossing Removal makes so much sense on a number of different levels. The Upfield shared use bike path has growing congestion issues, not only for the number of cyclists that use the path on a daily basis, but the growing numbers of pedestrians and others that use the path, including people with prams and walking dogs. The path is a major arterial cycling commuter route linking the suburbs of Moreland. It is used by many cyclists to get to work or travel the length of the municipality to do shopping or meet friends. But it severely suffers from its current constriction of space, congestion and multiple use. Level Crossing removal without considering the specific needs of commuter cyclists would be a failure of new infrastructure to meet the needs of present and future cyclists and citizens in Moreland. The Level Crossing removal provides an important opportunity to improve cycling infrastructure in a fundamental way. Brunswick and Coburg in particular, and Moreland generally, has seen a rise in cycling over the last decade, more so than just about anywhere else in the state of Victoria. This has been spurred by urban consolidation and the cosmopolitan cultural development of the municipality, the need for climate action and sustainable transport, and health risk concerns over obesity and need to reduce air pollution. The Coburg level Crossing removal project will eliminate four level crossings at one go: Bell Street, Munro Street, Reynard Street and Moreland Road. One of the problems with removal of the level crossings is it will eliminate the ‘Upfield Wave’ effect for cyclists. What is the ‘Upfield Wave’ effect? This is when cyclists use the present train movement to travel through multiple level crossings without the need to stop, making for smooth flowing, more energy efficient and faster journey. Not every cycling journey involves the Upfield Wave. Sometimes you get no boost, sometimes assistance through one or two level crossings, but if you get the timing right it can be four to six crossings, to make a substantial difference to journey time and energy expended. Momentum and energy efficiency is important if your a cyclist, and traffic and transport planners seldom take this into account when building transport infrastructure. It is one of the reasons many cyclists choose to cycle on the road where momentum can more easily be maintained and managed efficiently for greater distance in traffic rather than a bike path in which you need to stop and change your momentum every 500 metres or so for intersections where cars are given priority. remove conflict between commuter cyclists and pedestrians. commuter cyclists could maintain their speed, momentum and traffic flow. boosts commuter cycling in Moreland, enhancing sustainable transport mode shift. indirectly reduces transport emissions, congestion, adds to healthier transport habits. An elevated cycle path could be a mixture of suspended path under the rail viaduct and also attached to the side of the viaduct at Bell street and Moreland Road where more clearance was required. As it is designed for commuter cyclists it would need only limited access points. I suggest the path should follow the new rail gradient north of Bell Street and south of Moreland Road. This is a distance of about 2.33 kilometres between Tinning and O’Hea Streets. Cyclists with intermediate destinations would be encouraged to use the enhanced ground level paths created by the elevated rail. Can I point to an example of the sort of infrastructure I am arguing for? Yes. The Gardiners Creek Trail is suspended for about 1 kilometre under the Monash Freeway/Citylink before it meets the main Yarra Trail. This part of the Gardiners Creek Trail gives an idea of the possibility for doing an elevated cycle veloway for the Upfield line as part of the Coburg level crossing removal. 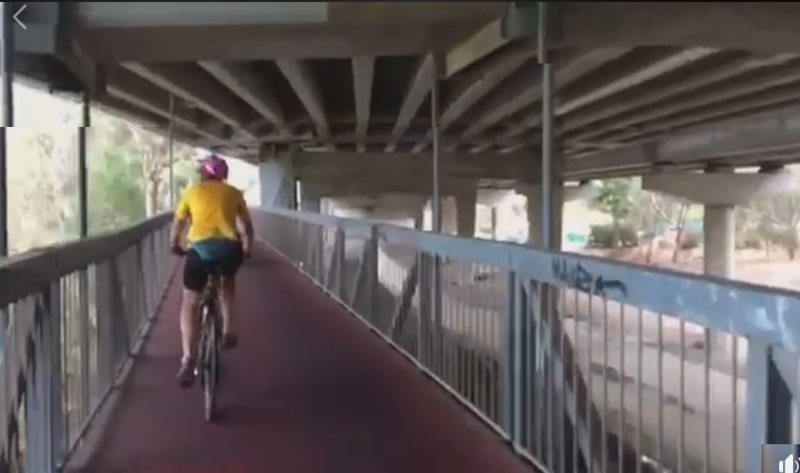 While the design and engineering would be different for the Upfield veloway, it highlights how cycling infrastructure can be incorporated with elevated road or rail infrastructure. If the LXRA does not seriously investigate an elevated veloway as part of the design, then they are failing their specific mandate to provide improved cycling infrastructure as part of level crossing removal, and their general mandate under the Transport Integration Act 2010. It is time for the Level Crossing Removal Authority to step up and provide an integrated solution for both improving rail transport and active transport in Coburg and improved cycling facilities that should be an integral part of the project construction. Posted on April 4, 2019 by John EnglartPosted in LXRATagged Coburg, LXRA, Skyrail, Veloway.